Are you a ringer? or a leaner? 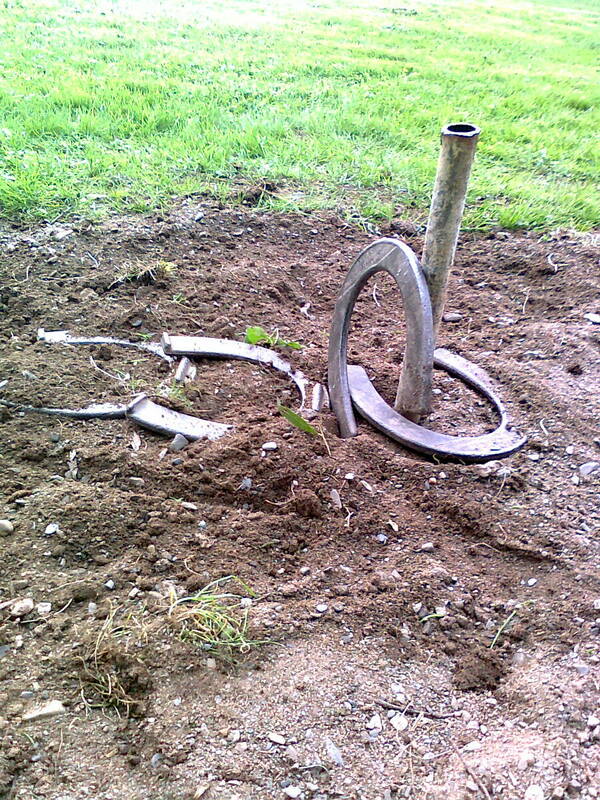 Have you ever played horseshoes? It’s a fun game of skill. My dad and I have been playing horseshoes a little this Summer (now turned Autumn) and – although we certainly aren’t the greatest at it – we have lots of laughs. Two pits are prepared, into each is driven a stake forty-two feet from the other. From beside one pit the players throw two horseshoes each, in turn, trying to get a ringer (shoe around stake) for five points, a leaner for three points, or within a horseshoe width for one point. Then the players walk to the other end, add up their points and pitch the shoes to the other pit. Eventually, a total of 21 points wins. Take a look at the image here. This was amazing! Both the ringer and the leaner are mine! Dad got one shoe close enough for a point, the other just a little too far out. This was such a great toss that we had to capture it because I thought no one would believe it. Of course, we have not been able to repeat this exactly again. In fact, when we get a point it’s occasion to cheer. 🙂 That’s right, we won’t be asked to join a team any time soon, but, as I said, we have fun. It’s a good way to get exercise, too. Looking at this picture I began wondering about it in relation to life. A ringer — do you hit your mark? Do you reach your goal? A leaner — do you nearly get there, not quite where you want to be but enough so that you can say you did it? Close — the old saying is, “close only counts in horseshoes.” Do you get nearly there and then decide this is close enough? Not quite there — do you think, “well at least I tried”? I wonder what my own attitude has been. I can go many ways with this but if I relate it to writing I know I have not made that ringer. I’m not sure I even have a leaner, either. But I may be close, although for me it’s not close enough yet. And I have had many days of thinking, “well, at least I’m trying”, but if I am truly going to succeed I know I have yet to develop my skill. The secret, the trick, is to never quit, never give up. In writing there are so many, many ways to express one’s ideas and imaginings, many places to apply one’s talent, many word avenues to travel. And one has to learn how to pitch, how to lean in, how to get close enough so as to eventually succeed. Am I there yet? No. But I am still trying, still in the game, even with all of life’s sidelines and stressors and detours. How about you? Are you a ringer? a leaner? Are you close? or not quite there yet? This entry was posted in Miscellanea, Preambles to Writing and tagged attitude, game, horseshoes, leaner, pitch, ringer, skill, Writing. Bookmark the permalink. This is a great analogy. Some days I think I am a ringer, other days I think I am close. Here is a quote I just discovered. “A professional writer is an amateur who didn’t quit.” Richard Bach I believe we can all be ringers if we just don’t quit. Thanks Lynn! Staying with it is the hard part, some days more than others, I find. With all the things that pull one’s attention – usually away from writing – it is a challenge to stay the course. You have succeeded where I have not, but I still have hope. Interesting way to think of it. I’m afraid too often I’m an “not quite” and let my self be satisfied. I need to move up a category most definitely.